Following the listing of its subdivided 7.775bon shares of RM0.01 each on 24 November, DIGI prices retreated from as high as RM3.88 on 23 November to close at intraday low of RM3.54 on 25 November. The correction from its RM3.88 high nearly reached the 38.2% FR level (RM3.50) and we think a temporary base has been formed. If prices can continue to consolidate from here, there is a good chance that DIGI may reclaim the RM3.65 (23.6% FR) and RM3.75 (upper Bollinger band) and possibly even RM3.88. Technical indicators are still showing more weaknesses ahead but traders with higher risk appetite may BUY on weakness before stronger rebound set in. However, cut loss if the RM3.40 level (near the 50% FR) is breached. 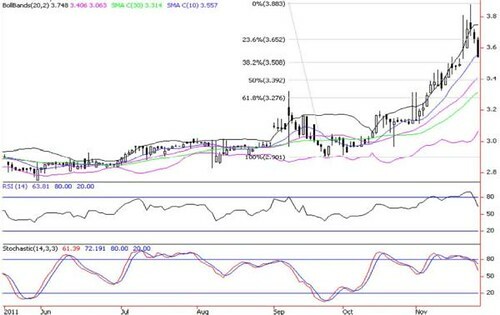 Once this level is violated, the bears will send prices lower towards RM3.31 (30-d SMA) and RM3.27 (61.8% FR). Genting Malaysia: More Surprises Ahead?